After twenty years of marriage, Brooke Whitman’s life changes when she comes home to find her husband in bed with another woman. With her kids in college, Brooke takes the settlement money from her divorce and heads south to some place warmer than Michigan. She stops in Destin, Florida, deciding this is the place to find herself. What she ends up finding is Chance Evans. 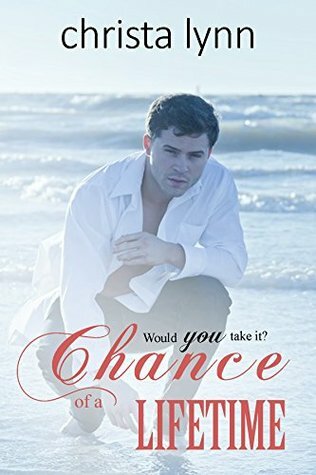 Chance, a waiter at the local restaurant, ends up saving Brooke’s life. She’s not ready for dating and tries to avoid him, but his flirting sets her pulse racing. Chance Evans is more than he appears. He’s a bounty hunter, working for the U.S. Coast Guard. He doesn’t follow the rules and is a take no prisoner kind of guy. His job is dangerous and he swears to keep Brooke out of his life, but danger finds her. Both have to make a decision: do they take the chance of a lifetime or go their separate ways? I enjoyed this book, but struggled in part with the writing. The storyline is interesting, but the twists and turns were predictable. There is potential for this book to be very good, but there are continuity and editing issues, which should have been picked up in a close read. They make the book feel rushed. In saying that, I did like the book. I’ve read other works by this author and enjoyed those as well. I look forward to future works, too.